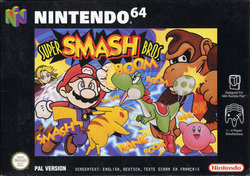 This is the first game in the Smash Bros. series, which sees various Nintendo heroes coming together to fight one another. While it does contain a formula for a very good game, I think this particular instalment is rather poor and only worth looking at to see what inspired the later ones. While I’m not usually one to be bothered by graphics (I just look at older games as having their own unique art style) this game just looks ugly to me. Lots of the characters look like their model from another game was taken and then made uglier; this seems to be especially true in the cases of Mario and Link. Every level is side-scrolling, but the whole world is made from 3D too, which is quite nice, I guess, but I still find the game quite aesthetically unpleasing. There is only a very slight story to this game: Master Hand (a giant floating hand) has taken all of our favourite heroes and forced them to fight one another. You choose a character, fight everybody else, then fight Master Hand, and that’s it. I often find that lack of a story isn’t much of a problem for most video games, but I think it is here: since you’re just fighting the same few people (there are eight characters you can be, four to be unlocked, and three you fight but never unlock) it quickly begins to feel repetitive. After you’ve gone through the game with every character, which won’t take long, you pretty much can only do it again but on a harder difficulty. As well as the fighting stages, there are three kinds of mini-games to play too: “Break the Targets”, “Board the Platforms” and “Race to the Finish”. In “Break the Targets” your character is put in their own unique stage full of little targets to break, some of these are in hard to reach areas and you’re likely to fall in a hole trying to get them. “Board the Platforms” is similar, except instead of breaking targets, you’re landing on various floating platforms scattered around the stage. Finally “Race to the Finish” is a set course where the characters must rush through various obstacles in order to reach an exit, this one is my favourite as the other both seem slightly tedious to me. This game isn’t entirely bad, as I say, it lead to much better sequels, so, without this, they’d never have happened. I also love crossovers, so, I do really love the fact that several of my favourite characters have been brought together in this game (including Mario, Donkey Kong, Pikachu, Link, Samus and more.) Plus, the multiplayer is quite fun, especially if you can find three other people to play with. There just isn’t really that much too this game, and it feels like it gets boring quickly.